You, the Being also called the “Self” is made of the Physical Body, the Mind, and the Spirit. The Body is physical and it is made of energy. The Mind also called the Awareness is the conscious and sub-conscious is metaphysical and it is made of energy. The Spirit is connected with the Universal consciousness. It is metaphysical and it is made of energy. Physical objects like Crystals & Gemstones, Pace-makers, mobile phones, all have energy impact on the physical body. They give off forms of physical and meta physical electricity that sends signals, makes things beat, and energize the physical Body. “Intention” means end point. It is the position that you keep one eye on at all times to make sure your airplane lands in Hawaii. And that along the way is making constant progress towards the intended destination. “Setting your intention” means making the decision. To life the best version of Self, Attitude is Exceptionally Important. Attitude positive and negative determines your path and end outcomes. Crystal & Gemstones amplify Attitude and resonate with such stability that negativity is repelled away and positivity is boosted. Attitude is something that is owned. No one else can take it or determine it. Attitude is Exceptionally Important and you own yours 100%. It is within the power of the individual to decide on Attitude. No one else owns nor decides your attitude but you. Energy that is electricity can be stored in a battery, energy can be stored in oil, energy is also stored in Crystals, energy is stored in Gemstones. Crystals & Gemstones have formed over millions of years by natural processes by the forces of Earth like heat, weight, water, motion, and light. The natural elements have contributed to the formation and the contents of the particular Stone. This is why there are so many sizes, shapes, and colors. Colors, textures, shapes, and sizes are determined by the energy forces put onto the creation of the Stone. These energy forces are embedded within each type of stone. Each type of stone has an impact on you… the Being. The size of the stone further amplifies the energy impact. However coming into contact with the energy field is like coming into contact with warm water. The body sensors pick up the signal no matter the temperature. A Positive Attitude and a good approach creates harmony, it creates wellness, and contributes to Well-Being. **anchor habits are a base habit to attach new daily habits that assists in integrating new details into existing routines. 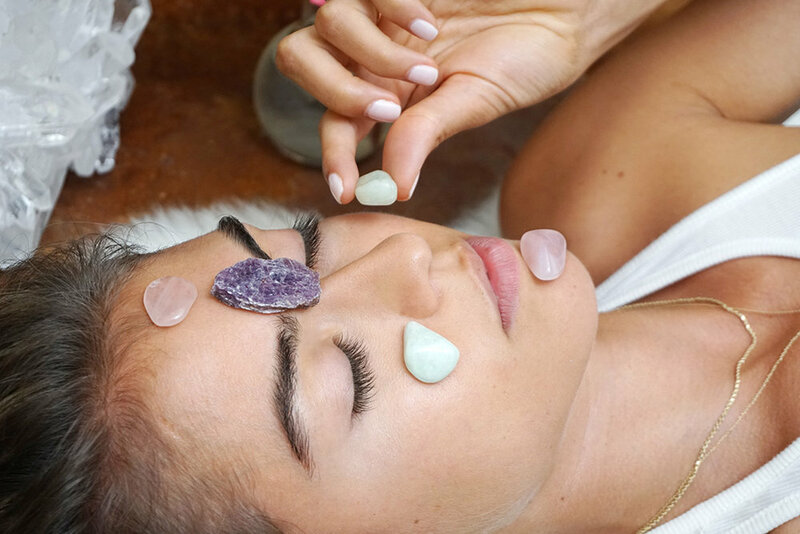 Crystals & Gemstones have been used to help clear, infuse, and balance the Chakras for thousands of years. Every Crystal and every Gemstone has a frequency. All of the 7 Chakras have and work on a frequency. It is to connect the right Stone to the Chakra base on your Intention or intended outcome. The Goal of Chakra Healing is to properly open the 7 Chakras of the Body, the Mind, and the Spirit so that active energy flows through each of them. These Chakras are the Root Chakra, Sacral Chakra, the Solar Plexus Chakra, Heart Chakra, Throat Chakra, Third Eye Chakra, and the Crown Chakra. Chakras begin at the pelvis with the Root and ascend upwards to the top over the crown of the head, like a bird's eye view over you and everything from the Crown Chakra. The Body is energy in its base form and adjusts itself to frequencies that it recognizes. If you understand English frequency then when someone is speaking it your mind recognizes the frequency pattern. Chakra Healing is a method of harmonizing parts of the body energetically, like the tuning of a radio to a channel and the tuning of the string on a guitar. When the strings are all in harmony, when the radio station is in harmony the Body Mind and Spirit can ‘hear it’ and interact. Energy Flows through the energy centers of the body and the person feels more and more integrated within the Self,… to the Earth,… and to the Universal Existence of everything. Crystals & Gemstones are key players in Chakra Energy Healing and Chakra Opening because they encourage this process of opening up the Chakras of your Mind Body Spirit. This process of signals can make the body feel good and throw your hands up in the air the way winners do. The signals can make you Heart feel good and smile. The signals can make you feel good and inspire the Spirit to create something good for the Well-Being of the Self and others as part of the bigger picture. Chakra Opening is the process of further opening Chakras that are already open for a greater energy Flow. We are surrounded by energies that encourage feeling good, and some that feel bad. If a bad-feeling negative things comes near the inner guides let you know. The inner guides are here to help you notice things and to make positive choices on behalf of the mind-body-spirit for “good feeling” experiences that are in harmony with you and useful to your Life Purpose. A Basic Principle of Crystals & Gemstones is shown by tuning forks. If there are two tuning forks and one is struck it starts vibrating. Then the other tuning forks without being struck start to also vibrate. Even if one does not understand why, it is clear that they are vibrating. This is why your closest friends matter. You are all tuning forks for one another. Choose wisely and it is okay to dismiss those that are out of tune. Crystals work with your body like tuning forks vibrating. This is a basis for the use of Crystals & Gemstones in Chakra Healing. If there is an energy block in one of the 7 Chakra zones because of a bad emotion, negative experience, or a negative environment this block must be cleared over time to prevent the Body Mind Spirit from having distress that lowers Well-Being.